WILLEMSTAD - On Thursday, April 13th, 2017 Mr. Leendert A.B. is Rojer WAS sworn in as minister plenipotentiary in The Hague. 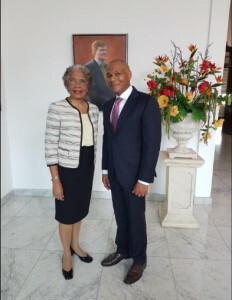 He will be representing Curaçao in the Netherlands and in the Kingdom Government. Mr. Rojer will be station in The Hague until a new government has been formed. He has taken his oath in front of the Governor of Curaçao, Her Excellency Lucille George-Wout.